Established in 1948, Thollon Les Mémises is a charming ski resort located at 1,000m altitude in the prosperous Chablais region of the French Alps, on the edge of the French-Swiss border. Thollon’s chief claim to fame is its wonderful view of Lac Léman, better-known to English speakers as Lake Geneva. In fact, Thollon Les Mémises is one of the only alpine resorts that can boast panoramic views overlooking the great lake, hence its nickname: Le Balcon du Léman (The Balcony of the Léman). 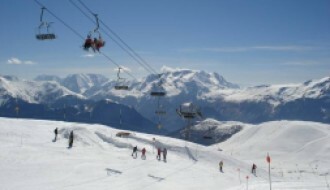 Thollon Les Mémises is a thoroughly modern and well-appointed winter sports destination. 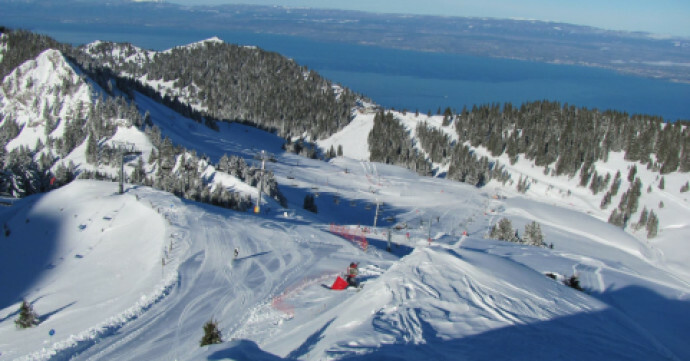 It offers a wide range of runs between 1,000m and 2,000m altitude, catering to both beginners and more seasoned skiers and snowboarders. 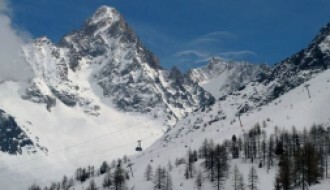 There are approximately 50km of slopes to enjoy, with 16 pistes served by 14 ski lifts (including a new gondola which opened in 2014), so you can get around the area with great ease. The majority of runs are blue (beginner) and red (intermediate), which makes Thollon Les Mémises perfect for families and those learning to ski or snowboard, but there are also a couple of black (expert) runs catering to more seasoned visitors. The slopes themselves are wide and most lie on the sunny south side of the mountain. Thollon Les Mémises also has 10 snow cannons to augment snow coverage if necessary. In addition to the more traditional pistes, there is one cross-country ‘Nordic’ skiing trail that is free to use and runs for 6km at 1,600m altitude, plus a snow park with halfpipe where snowboarders can try out their freestyle jumps and tricks. Paragliding is also a popular activity in this region, and in the summer months hiking, trail-running, white-water rafting and mountain biking are all widely enjoyed. And of course, a huge range of world-class water sports is on offer at nearby Lake Geneva. Looking outside of the resort, Thollon Les Mémises could hardly be better located in terms of neighbours. Thollon Les Mémises is blessed with the glittering jewels of Lake Geneva on its doorstep to the north, as well as the beautiful spa town of Evian - famous for its bottled spring water and jet-set lifestyle. It is also just north of the chic town of Montreux, known around the world for its annual jazz festival. To the south, located less than an hour away by car or train, you will find lively alpine resorts such as Morzine and Avoriaz. These neighbouring resorts offer up a whole new set of pistes and runs, perfect for any keen skier and snowboarder, as well as a thriving nightlife. The most recent historical snow report reveals that in 2017 Thollon Les Mémises experienced a total snowfall of 148cm, with a maximum base depth of 50cm and a maximum summit depth of 270cm. The average snow base depth was 35cm with an average summit depth of 197cm. There were 14 snow days in total and the biggest snowfall was 25cm. As mentioned above, the resort has many snow cannons at its disposal to ensure excellent snow coverage no matter what the conditions. 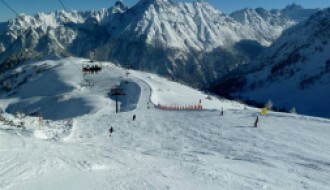 For the latest snow report, check out our Thollon Les Mémises resort information page here. As for its general climate, Thollon Les Mémises makes the most of its clement position overlooking Lake Geneva. It enjoys more warm days than the majority of alpine resorts, with average monthly temperatures ranging between 1°C (January) and 19°C (July). An up-to-the-minute weather report for Thollon Les Mémises can also be found in our resort guide here. With a residential population of around 800 people, Thollon Les Mémises is one of the more delightful village resorts in the region, so even in the high winter season, it doesn’t feel overcrowded. As such, it enjoys a superb community spirit and a high quality of life, but there is still some room for it to grow and blossom as a resort. This makes it an enticing prospect if you are interested in buying a property in Thollon Les Mémises. The village is beautifully appointed and very well-kept by its proud residents. It features traditional wooden buildings in the rural style, with a generous range of hotels, bars and family-owned restaurants, plus a local cinema and resident doctor. The nearest school is also located just a short 2km away. For a mountain resort, Thollon Les Mémises is very easily accessed. The nearest international airport is Geneva (approximately 50km away), from which you can drive in less than an hour-and-a-half. Public transport is also an option, although this journey, by train and bus, takes around twice as long. Please note that the village has one public car park, which naturally tends to fill up quite quickly in the high winter season.